Phil Ochs- A Musical Conscience of the 1960s and Beyond - History? Because it's Here! Phil Ochs would appreciate the irony. April 9, 2012, is the thirty-sixth anniversary of his death and he died just eight months before his thirty-sixth birthday. During the folk music and protest song era of the late 1950s and 1960s, Philip David Ochs wrote hundreds of songs and released eight albums. His most famous songs include I Ain’t Marching Anymore, Crucifixion, Draft Dodger Rag, Love Me, I’m a Liberal, Outside of a Small Circle of Friends, and Power and the Glory. From 1964-1966, Phil Ochs recorded his first three albums for Elektra Records with only an acoustic guitar for an accompaniment. In 1964 he recorded All the News That’s Fit to Sing, in 1965, I Ain’t Marching Anymore and in 1966 Phil Ochs in Concert. His record sales increased with each new album and the critics praised them. In 1962, Phil Ochs married Alice Skinner, a photographer, and they had a daughter Meegan. The next year, 1963 was traumatic for Phil and America when President John F. Kennedy was assassinated on November 22, 1963. Although he disagreed with President Kennedy over issues like the Cuban Missile Crisis and Vietnam, Phil wept at the assassination. He told his wife Alice that he thought he would die as well. Alice Ochs said that was the only time she ever saw Phil cry. In 1965, Phil and Alice separated but they never divorced. By 1967, Phil’s brother Michael managed him, he had left Elektra for A & M Records and he moved to California. In 1967 he recorded Pleasures of the Harbor, in 1968 Tape from California, in 1969 Rehearsals for Retirement and in 1970 Greatest Hits which actually consisted of all new material. In his A &M albums Phil abandoned his former solo acoustic guitar renditions and explored ensemble and orchestral instrumentation, attempting to produce a hybrid folk-pop hit. Phil Ochs created a prodigious number of songs in the 1960s, a few just narrowly missing becoming hits. Outside of a Small Circle of Friends reached number 119 on Billboard’s national Hot Prospect listing. Joan Baez reached number eight in the United Kingdom with Phil’s song There but for Fortune and in the United States it reached number fifty on the Billboard charts. According to his biographer Marc Eliot, in December 1969 Phil Ochs testified for the defense at the Chicago Seven trial. His testimony included reciting the lyrics of his song I Ain’t Marching Anymore. As he left the courthouse, Phil sang his song to the press corps with results that amused him. That evening Walter Cronkite broadcast his performance on the CBS Evening News, an event that some musicians would argue surpassed a number one Billboard hit. During the 1970s, Phil Ochs gradually succumbed to his personal demons, including bipolar disorder and alcoholism and in 1976, he hanged himself. Three decades and counting after he died, Phil Ochs still influences singers and audiences around the world, some who were not even born when he died. Online discussion groups and websites are dedicated to Phil Ochs and his music and writers continue to produce articles and books about his music and his life. Phil’s sister Sonny Ochs Tanzman manages an ongoing series of Phil Ochs Song Nights with performers who sing his songs across the United States and the rest of the world. His brother Michael archives his music and his daughter Meegan worked with Michael to produce a box set of his music called Farewells & Fantasies. Thirty-two years after his death, the North American Folk Music and Dance Alliance awarded the 2009 Elaine Weissman Lifetime Achievement Award to Phil Ochs. Although Phil Och’s contemporaries like Bob Dylan, Pete Seeger, Peter Paul and Mary and other luminous 1960s folksingers often overshadowed his music, his distinctive sound and passionate convictions still solidly survive and contain important messages for today’s world. I Ain’t Marching Anymore is a narrative protest song covering the history of American wars. Phil Ochs narrates the song from the point of view of a soldier marching into a continuous line of battles in American history until he decides not to fight any more wars. This is one of Phil’s best narrative protest songs. The Power and the Glory celebrates the beauty of America and the strength of Americans while it challenges them to preserve America’s heritage. The Men Behind the Guns is Phil Och’s tribute and reminder that behind the pomp and spit and polish of the generals and officers of war are the men in ordinary uniforms who fight and make the often unacknowledged sacrifices. Love Me I’m a Liberal This song dismantles the liberals that Phil Ochs says are “ 10 degrees to the right of center when it affects them personally.” Liberals weren’t the only political group that Phil satirized. He was an equal opportunity satirist. The Draft Dodger Rag Phil Ochs wrote several serious protest songs against the Vietnam War, and while he uses humor in this one, there is a serious underlying message behind the humor. Crucifixion Phil Ochs said that this song is a tribute to John F. Kennedy and his assassination as well as others who were assassinated in the 1960s, including Medgar Evers, Robert Kennedy, and Martin Luther King Jr. The powerful words of this song explore the complexities and contradictions of human nature and the way it plays out across history. Outside of a Small Circle of Friends In this song, Phil Ochs examines the human tendency not to want to get involved in the problems of others, and underscores the absolute necessity for people to get involved with each other. Is There Anybody Here? Phil Ochs believed that if individuals thought about the consequences of war, no one would want to start or fight a war. He asks these succinct war questions in this song and they are still relevant several decades and wars later. Followin' the orders takes away the blame? Who wouldn't mind a murder by another name? With the honor of the brave, and the courage of the blind? The Pleasures of the Harbor A superficial understanding of this song would interpret it as the story of a sailor enjoying the pleasures of the harbor – wine, women, and song. Perhaps Phil Ochs meant the underlying meaning of the song as a metaphor for life and how necessary it is to pause and enjoy the “pleasures of the harbor” before meeting and overcoming the daily challenges of life. When I’m gone In this song which has tragic and poignant nuances because of his short life, Phil Ochs sings about the beauties of life including sunrises and sea sands. He also decries injustice and emphasizes peace and change and living each day fully. Brend, Mark. American Troubadours: Groundbreaking Singer-Songwriters of the 60s. San Francisco: Backbeat Books, 2001. Eliot, Marc. Death of a Rebel: A Biography of Phil Ochs. New York: Franklin Watts, 1989. 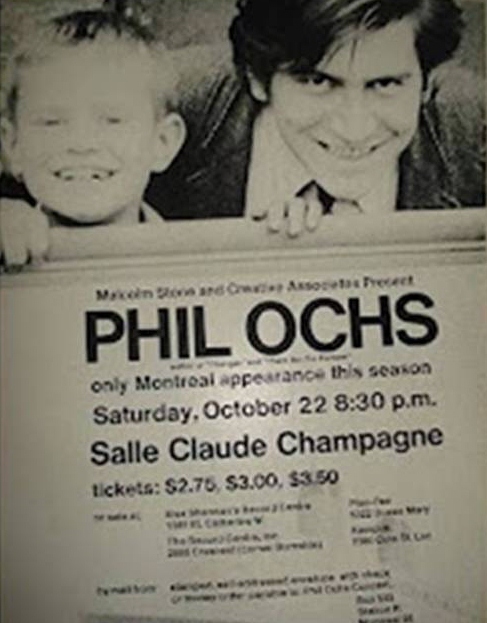 Ochs, Phil. Songs of Phil Ochs. New York: Appleseed Music, 1964. Schumacher, Michael. There But for Fortune: The Life of Phil Ochs. New York: Hyperion, 1996.